In 1999, when he was 13 years old he created the website Theinfo.org, a library where everyone was able to write and correct information; it was the predecessor of Wikipedia, created years before it. Theinfo.org made Swartz the winner of the ArsDigita Prize, given to young people who create "useful, educational, and collaborative" noncommercial websites. At age 14, he became a member of the working group that authored the RSS 1.0 web syndication specification. Swartz attended Stanford University, but dropped out after his first year. During Swartz's first year at Stanford, he applied to Y Combinator's very first Summer Founders Program, proposing to work on a startup called Infogami, designed as a flexible content management system to allow the creation of rich and visually interesting websites or a form of wiki for structured data. After working on Infogami with co-founder Simon Carstensen over the summer of 2005, Aaron opted not to return to Stanford, choosing instead to continue to develop and seek funding for Infogami. As part of his work on Infogami, Swartz created the web.py web application framework because he was unhappy with other available systems in the Python programming language. In early fall of 2005, Swartz worked with his fellow co-founders of another nascent Y-Combinator firm Reddit, to rewrite Reddit's Lisp codebase using Python and web.py. Although Infogami's platform was abandoned after Not a Bug was acquired, Infogami's software was used to support the Internet Archive's Open Library project and the web.py web framework was used as basis for many other projects by Swartz and many others. When Infogami failed to find further funding, Y-Combinator organizers suggested that Infogami merge with Reddit, which it did in November 2005, resulting in the formation of a new firm, Not a Bug, devoted to promoting both products. As a result of this merger, Swartz was given the title of co-founder of Reddit. Although both projects initially struggled to gain traction, Reddit began to make large gains in popularity in 2005 and 2006. In September 2007, Swartz joined with Infogami co-founder Simon Carstensen to launch a new firm, Jottit, in another attempt to create another markdown driven content management system in Python. Author Cory Doctorow, in his novel Homeland, "drew on advice from Swartz in setting out how his protagonist could use the information now available about voters to create a grass-roots anti-establishment political campaign." In an afterword to the novel, Swartz wrote, "these political hacktivist tools can be used by anyone motivated and talented enough.... Now it's up to you to change the system. ... Let me know if I can help." We sent our results to the Chief Judges of 31 District Courts ... They redacted those documents and they yelled at the lawyers that filed them ... The Judicial Conference changed their privacy rules. ... [To] the bureaucrats who ran the Administrative Office of the United States Courts ... we were thieves that took $1.6 million of their property. One of his works that supports activism is SecureDrop (originally named DeadDrop), a platform for secure communication between journalists and sources (whistleblowers) used at several news organizations, including The Washington Post and The Guardian. Swartz participated in Wikipedia from August 2003. In 2006, he ran unsuccessfully for the Wikimedia Foundation's Board of Trustees. Aaron Swartz noted that the knowledge produced at public universities and financed by US government and graduated students was not released free to the public. Instead, it was being copyrighted and benefits were not given to the authors but was being privatized and locked by for-profit corporations that did not invest in these public works. They instead earned billions of US$ each year for private publishers, since these publications were of free access to students in academic databases. Swartz used a full text scholarly online databases, JSTOR, to which he accessed through MIT network in order to download books, journals, etc produced thanks to public funds and paid by money collected by taxpayers. Aaron also downloaded the whole Westlaw legal database uncovering troubling connections of corporations funders of legal research that gave money to law professors who wrote law review benefit and shield these corporations. The authorities said Swartz downloaded the documents through a laptop connected to a networking switch in a controlled-access wiring closet at MIT. The door to the closet was kept unlocked, according to press reports. When discovered, a video camera was placed in the room to film Swartz and Swartz's computer was left untouched. Once video was captured of Swartz, the download was stopped and Swartz was identified. Rather than pursue a civil lawsuit against him, in June 2011 they reached a settlement wherein he surrendered the downloaded data. On July 30, 2013, JSTOR released 300 partially redacted documents, which had been provided as incriminating evidence against Aaron Swartz. These documents were originally sent to the United States Attorney's Office in response to subpoenas in the case United States v. Aaron Swartz. "Root Cause Analysis" Report (side 1), showing a descriptive timeline of events from September 25, 2010, until December 26, 2010. "Root Cause Analysis" Report (side 2), showing JSTOR response and incident resolution procedures. Email sent from JSTOR to Stephan, Heymann (USAMA), estimating 3.5 million PDF files had been downloaded. Describes PDF download activity, from JSTOR's databases to MIT servers, between November 1 and December 27. PDF activity, from JSTOR to MIT, between January 1 to 15. On the night of January 6, 2011, Swartz was arrested near the Harvard campus by MIT police and a United States Secret Service agent. He was arraigned in Cambridge District Court on two state charges of breaking and entering with intent to commit a felony. Swartz died of suicide on January 11, 2013. After his death, federal prosecutors dropped the charges. On December 4, 2013, due to a Freedom of Information Act suit by the investigations editor of Wired magazine, several documents related to the case were released by the Secret Service, including a video of Swartz entering the MIT network closet. Days before Swartz's funeral, Lawrence Lessig eulogized his friend and sometime-client in an essay, Prosecutor as Bully. He decried the disproportionality of Swartz's prosecution and said, "The question this government needs to answer is why it was so necessary that Aaron Swartz be labeled a 'felon'. For in the 18 months of negotiations, that was what he was not willing to accept." Cory Doctorow wrote, "Aaron had an unbeatable combination of political insight, technical skill, and intelligence about people and issues. I think he could have revolutionized American (and worldwide) politics. His legacy may still yet do so." Several memorials followed soon afterward. On January 19, hundreds attended a memorial at the Cooper Union, speakers at which included Stinebrickner-Kauffman, open source advocate Doc Searls, Creative Commons' Glenn Otis Brown, journalist Quinn Norton, Roy Singham of ThoughtWorks, and David Segal of Demand Progress. On January 24, there was a memorial at the Internet Archive with speakers including Stinebrickner-Kauffman, Alex Stamos, Brewster Kahle, and Carl Malamud. On February 4, a memorial was held in the Cannon House Office Building on Capitol Hill; speakers at this memorial included Senator Ron Wyden and Representatives Darrell Issa, Alan Grayson, and Jared Polis, and other lawmakers in attendance included Senator Elizabeth Warren and Representatives Zoe Lofgren and Jan Schakowsky. A memorial also took place on March 12 at the MIT Media Lab. On January 12, 2013, Swartz's family and partner issued a statement criticizing the prosecutors and MIT. Speaking at his son's funeral on January 15, Robert Swartz said, "Aaron was killed by the government, and MIT betrayed all of its basic principles." Tom Dolan, husband of U.S. Attorney for Massachusetts Carmen Ortiz, whose office prosecuted Swartz's case, replied with criticism of the Swartz family: "Truly incredible that in their own son's obit they blame others for his death and make no mention of the 6-month offer." This comment triggered some criticism; Esquire writer Charlie Pierce replied, "the glibness with which her husband and her defenders toss off a 'mere' six months in federal prison, low-security or not, is a further indication that something is seriously out of whack with the way our prosecutors think these days." Reuters news agency called Swartz "an online icon" who "help[ed] to make a virtual mountain of information freely available to the public, including an estimated 19 million pages of federal court documents." 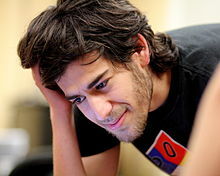 The Associated Press (AP) reported that Swartz's case "highlights society's uncertain, evolving view of how to treat people who break into computer systems and share data not to enrich themselves, but to make it available to others," and that JSTOR's lawyer, former U.S. Attorney for the Southern District of New York Mary Jo White, had asked the lead prosecutor to drop the charges. 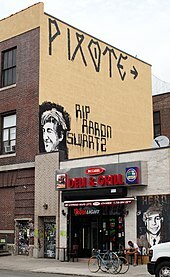 As discussed by editor Hrag Vartanian in Hyperallergic, Brooklyn, New York, muralist BAMN ("By Any Means Necessary") created a mural of Swartz. "Swartz was an amazing human being who fought tirelessly for our right to a free and open Internet," the artist explained. "He was much more than just the 'Reddit guy'." Speaking on April 17, 2013, Yuval Noah Harari described Swartz as "the first martyr of the Freedom of Information movement." In October 2014, Killswitch, a film featuring Aaron Swartz, as well as Lawrence Lessig, Tim Wu, and Edward Snowden, received its world premiere at the Woodstock Film Festival, where it won the award for Best Editing. The film focuses on Swartz's integral role in the battle to control the Internet. In February 2015, Killswitch was invited to screen at the Capitol Visitor's Center in Washington, D.C. by Congressman Alan Grayson. The event was held on the eve of the Federal Communications Commission's historic decision on Net Neutrality. Congressman Grayson, Lawrence Lessig, and Free Press CEO Craig Aaron spoke about Swartz and his fight on behalf of a free and open Internet at the event. Congressman Grayson states that Killswitch is "one of the most honest accounts of the battle to control the Internet – and access to information itself." Richard von Busack of the Metro Silicon Valley writes of Killswitch, "Some of the most lapidary use of found footage this side of The Atomic Café". Fred Swegles of the Orange County Register remarks, "Anyone who values unfettered access to online information is apt to be captivated by Killswitch, a gripping and fast-paced documentary." Kathy Gill of GeekWire asserts that "Killswitch is much more than a dry recitation of technical history. Director Ali Akbarzadeh, producer Jeff Horn, and writer Chris Dollar created a human-centered story. A large part of that connection comes from Lessig and his relationship with Swartz." Patriot of the Web, an independent biographical film about Aaron Swartz, written and directed by Darius Burke, is set to be released in July 2019 on Amazon. The film had a limited video on demand release in December 2017 on Reelhouse and in January 2018 on Pivotshare. Another biographical film about Swartz, Think Aaron, is being developed by HBO Films. The story of Aaron Swartz has exposed the topic of open access to scientific publications to wider audiences. In the wake of Aaron Swartz, many institutions and personalities have campaigned for open access to scientific knowledge. The "cOAlition S", a consortium launched by the European Research Council continues the fight of Aaron Swartz with the will to make available to all by 2020 all the scientific publications financed by the member states of this coalition. Swartz's attorneys requested that all pretrial discovery documents be made public, a move which MIT opposed. Swartz allies have criticized MIT for its opposition to releasing the evidence without redactions. On July 26, 2013, the Abelson panel submitted a 182-page report to MIT president, L. Rafael Reif, who authorized its public release on July 30. The panel reported that MIT had not supported charges against Swartz and cleared the institution of wrongdoing. However, its report also noted that despite MIT's advocacy for open access culture at the institutional level and beyond, the university never extended that support to Swartz. The report revealed, for example, that while MIT considered the possibility of issuing a public statement about its position on the case, such a statement never materialized. Massachusetts Democratic Senator Elizabeth Warren issued a statement saying "[Aaron's] advocacy for Internet freedom, social justice, and Wall Street reform demonstrated ... the power of his ideas...." In a letter to Attorney General Eric Holder, Texas Republican Senator John Cornyn asked, "On what basis did the U.S. Attorney for the District of Massachusetts conclude that her office's conduct was 'appropriate'?" and "Was the prosecution of Mr. Swartz in any way retaliation for his exercise of his rights as a citizen under the Freedom of Information Act?" On February 22, Associate Deputy Attorney General Steven Reich conducted a briefing for congressional staffers involved in the investigation. They were told that Swartz's Guerilla Open Access Manifesto played a role in prosecutorial decision-making. Congressional staffers left this briefing believing that prosecutors thought Swartz had to be convicted of a felony carrying at least a short prison sentence in order to justify having filed the case against him in the first place. On March 6, Holder testified before the Senate Judiciary Committee that the case was "a good use of prosecutorial discretion." Stinebrickner-Kauffman issued a statement in reply, repeating and amplifying her claims of prosecutorial misconduct. Public documents, she wrote, reveal that prosecutor Stephen Heymann "instructed the Secret Service to seize and hold evidence without a warrant... lied to the judge about that fact in written briefs... [and] withheld exculpatory evidence... for over a year," violating his legal and ethical obligations to turn such evidence over to the defense. On March 22, Senator Al Franken wrote Holder a letter expressing concerns, writing that "charging a young man like Mr. Swartz with federal offenses punishable by over 35 years of federal imprisonment seems remarkably aggressive – particularly when it appears that one of the principal aggrieved parties ... did not support a criminal prosecution." While the legislation has not passed as of October 2015[update], it has helped to prompt some motion toward more open access on the part of the US administration. Shortly after the bill's original introduction, the Office of Science and Technology Policy directed "each Federal agency with over $100 million in annual conduct of research and development expenditures to develop a plan to support increased public access to the results of research funded by the Federal Government." On August 3, 2013, Swartz was posthumously inducted into the Internet Hall of Fame. There was a hackathon held in Swartz' memory around the date of his birthday in 2013. Over the weekend of November 8–10, 2013, inspired by Swartz's work and life, a second annual hackathon was held in at least 16 cities around the world. Preliminary topics worked on at the 2013 Aaron Swartz Hackathon were privacy and software tools, transparency, activism, access, legal fixes, and a low-cost book scanner. In January 2014, Lawrence Lessig led a walk across New Hampshire in honor of Swartz, rallying for campaign finance reform. In 2017 the Turkish-Dutch artist Ahmet Öğüt commemorated Swartz through a work entitled "Information Power to The People" and depicting his bust..
Kazakh computer scientist and neuro-researcher Alexandra Elbakyan founded the website Sci-Hub. Sci-Hub gives access to paywalled articles through its repository without paying, as of 2016[update] holding over 50 million articles. Elbakyan has frequently been compared to Swartz in her solid criticism of paywalls and her dedication to Sci-Hub which she says will not be brought down regardless of lawsuits. PDF/ePub), New York City: Discovery Publisher . Swartz, Aaron (January – February 2002). "MusicBrainz: A Semantic Web service" (PDF). IEEE Intelligent Systems. 17 (1): 76–77. CiteSeerX 10.1.1.380.9338. doi:10.1109/5254.988466. ISSN 1541-1672. Swartz, Aaron; James Hendler (2009). Building programmable Web sites. S.F. : Morgan & Claypool. ISBN 978-1-59829-920-5. Swartz, Aaron (Interviewee). We can change the world (Video) – via YouTube. Swartz, Aaron (Speaker) (May 21, 2012). Keynote address at Freedom To Connect 2012: How we stopped SOPA (Video). D.C. – via YouTube. PDF). 3 (2): 1–64. doi:10.2200/S00481ED1V01Y201302WBE005. Lay summary. To Dan Connolly, who not only created the Web but found time to teach it to me. ^ a b Skaggs, Paula (January 16, 2013). "Aaron Swartz Remembered as Internet Activist who Changed the World". Patch. ^ "RSS creator Aaron Swartz dead at 26". Harvard Magazine. January 14, 2013. Swartz helped create RSS—a family of Web feed formats used to publish frequently updated works (blog entries, news headlines, ...) in a standardized format—at the age of 14. ^ a b "Markdown". Aaron Swartz: The Weblog. March 19, 2004. ^ a b Grehan, Rick (August 10, 2011). "Pillars of Python: Web.py Web framework". InfoWorld. Web.py, the brainchild of Aaron Swartz, who developed it while working at Reddit.com, describes itself as a 'minimalist's framework.' ... Test Center Scorecard: Capability 7; Ease of Development 9; Documentation 7; ...; Overall Score 7.6, Good. ^ Swartz, Aaron. "Sociology or Anthropology". Raw Thought. Retrieved January 16, 2013. ^ Swartz, Aaron (May 13, 2008). "Simplistic Sociological Functionalism". Raw Thought. Retrieved January 16, 2013. ^ a b "Lab Fellows 2010–2011: Aaron Swartz". Edmond J. Safra Center for Ethics. Harvard University. 2010. Archived from the original on May 29, 2013. During the fellowship year, he will conduct experimental and ethnographic studies of the political system to prepare a monograph on the mechanisms of political corruption. ^ a b Gerstein, Josh (July 22, 2011). "MIT also pressing charges against hacking suspect". Politico. [Swartz's] alleged use of MIT facilities and Web connections to access the JSTOR database ... resulted in two state felony charges for breaking into a 'depository' and breaking & entering in the daytime, according to local prosecutors. ^ a b c d e Commonwealth v. Swartz , 11-52CR73 & 11-52CR75, MIT Police Incident Report 11-351 (Mass. Dist. Ct. nolle prosequi December 16, 2011) ("Captain Albert P[...] and Special Agent Pickett were able to apprehend the suspect at 24 Lee Street.... He was arrested for two counts of Breaking and Entering in the daytime with the intent to commit a felony...."). ^ a b c d e f g "Indictment, USA v. Swartz, 1:11-cr-10260, No. 2 (D.Mass. July 14, 2011)". MIT. July 14, 2011. Retrieved January 23, 2013. Superseded by "Superseding Indictment, USA v. Swartz, 1:11-cr-10260, No. 53 (D.Mass. September 12, 2012)". Docketalarm.com. September 12, 2012. Retrieved January 23, 2013. ^ US Attorney's Office District of Massachusetts (July 19, 2011). "Alleged Hacker Charged With Stealing Over Four Million Documents from MIT Network". Press release. Archived from the original on May 26, 2012. Retrieved January 17, 2013. ^ "Aaron Swartz, Tech Prodigy and Internet Activist, Is Dead at 26". Time. January 13, 2013. Retrieved January 13, 2013. ^ "Aaron Swartz, internet freedom activist, dies aged 26". BBC News. January 13, 2013. Retrieved January 13, 2013. ^ a b "Internet Hall of Fame Announces 2013 Inductees". Internet Hall of Fame. June 26, 2013. Retrieved August 3, 2013. ^ "The Brilliant Life and Tragic Death of Aaron Swartz". Rolling Stone. ^ a b Nelson, Valerie J. (January 12, 2013). "Aaron Swartz dies at 26; Internet folk hero founded Reddit". Los Angeles Times. ^ a b c Swartz, Aaron (September 27, 2007). "How to get a job like mine". (blog). Aaron Swartz. We negotiated for months.... I started going crazy from having to think so much about money.... The company almost fell apart before the deal went through. ^ "Reddit co-creator Aaron Swartz dies from suicide". Chicago Tribune. January 13, 2013. ^ Skaggs, Paula (January 15, 2013). "Internet activist Aaron Swartz's teachers remember 'brilliant' student". Patch. Northbrook, Ill. Swartz ... attended North Shore Country Day School through 9th grade. ^ Swartz, Aaron (January 14, 2002). "It's always cool to run..." Weblog. Aaron Swartz. I would have been in 10th grade this year.... Now I'm taking a couple classes at a local college. ^ "Second ArsDigita Prize 2000 Finalists and Winners". December 1, 2001. Archived from the original on December 1, 2001. Retrieved March 6, 2016. ^ Schofield, Jack (January 13, 2013). "Aaron Swartz obituary". The Guardian. London. At 13 [he] won an ArsDigita prize for creating The Info Network. ^ Sekhri, Aaron (January 14, 2013). "Aaron Swartz, prodigy and drop-out, takes own life". The Stanford Daily. Retrieved March 20, 2019. ^ a b Ryan, Singel (September 13, 2005). "Stars Rise at Startup Summer Camp". Wired. Retrieved December 19, 2014. ^ a b Swartz, Aaron (2007). "Introducing Infogami". Infogami. CondeNet. Archived from the original on December 24, 2007. ^ "A passion for your users brings good karma: (Interview with) Alexis Ohanian, co-founder of reddit.com". StartupStories. November 11, 2006. Archived from the original on August 23, 2007. ^ a b Singel, Ryan (July 19, 2011). "Feds Charge Activist as Hacker for Downloading Millions of Academic Articles". Wired. Retrieved January 12, 2013. ^ "Breaking News: Condé Nast/Wired Acquires Reddit". Techcrunch. October 31, 2006. ^ Lenssen, Philipp (2007). "A Chat with Aaron Swartz". Google Blogoscoped. Archived from the original on April 27, 2010. Retrieved May 11, 2010. ^ "Aaron Swartz's Jottit has been officially released". Reddit. 2007. Retrieved October 20, 2015. ^ Eckersley, Peter (January 12, 2013). "Farewell to Aaron Swartz, an Extraordinary Hacker and activist". Deeplinks Blog. Electronic Frontier Foundation. ^ Matthews, Laura (July 19, 2011). "Who is Aaron Swartz, the JSTOR MIT Hacker?". International Business Times. Retrieved January 13, 2013. ^ "Our Mission" (blog). Demand Progress. Retrieved May 30, 2015. ^ a b Sleight, Graham (February 1, 2013). "'Homeland,' by Cory Doctorow". The Washington Post. As Doctorow made clear in his eloquent obituary, he drew on advice from Swartz in setting out how his protagonist could use the information now available about voters to create a grass-roots anti-establishment political campaign. ... One of the book's two afterwords is by Swartz. ^ a b c Lee, Timothy B.,The inside story of Aaron Swartz's campaign to liberate court filings, Ars Technica, February 8, 2013. Retrieved March 8, 2013. ^ Will Wrigley (February 7, 2013). "Darrell Issa Praises Aaron Swartz, Internet Freedom at Memorial". HuffPost. Retrieved February 21, 2013. ^ a b c d e f g Singel, Ryan (October 5, 2009). "FBI Investigated Coder for Liberating Paywalled Court Records". Wired. Retrieved January 12, 2013. ^ Johnson, Bobbie (November 11, 2009). "Recap: Cracking open US courtrooms". The Guardian. London. ^ Malamud, Carl (January 24, 2013). Aaron's Army (Speech). Memorial for Aaron Swartz at the Internet Archive. San Francisco. ^ Malamud, Carl (March 30, 2013). "On Crime and Access to Knowledge: An Unpublished Essay". ^ "Timothy Lee (Bio)". Retrieved May 6, 2016. ^ "Progressive Change Campaign Committee Statement on the Passing of Aaron Swartz". Retrieved November 19, 2014. ^ "How to Get a Job Like Mine (Aaron Swartz's Raw Thought)". aaronsw.com. ^ BoldProgressives (September 23, 2009). "Victory! HonorKennedy.com" – via YouTube. ^ "SecureDrop – The Washington Post". The Washington Post. December 12, 2017. Retrieved February 11, 2019. ^ Ball, James (June 5, 2014). "Guardian launches SecureDrop system for whistleblowers to share files". The Guardian. Retrieved February 11, 2019. ^ "The Guardian SecureDrop Server". The Guardian. Retrieved February 11, 2019. ^ a b c Wagner, Daniel; Verena Dobnik (January 13, 2013). "Swartz' death fuels debate over computer crime". Associated Press. JSTOR's attorney, Mary Jo White – formerly the top federal prosecutor in Manhattan – had called the lead Boston prosecutor in the case and asked him to drop it, said Peters. ^ a b Swartz, Aaron (May 21, 2012). "How we stopped SOPA" (video). Keynote address at the Freedom To Connect 2012 conference. New York: Democracy Now!. [T]he 'Combating Online Infringement and Counterfeiting Act' ... was introduced on September 20th, 2010.... And [then] it began being called PIPA, and eventually SOPA. ^ a b Aaron Swartz (interviewee) & Amy Goodman (May 21, 2012). Freedom to Connect: Aaron Swartz (1986–2013) on victory to save open Internet, fight online censors (Video). N.Y.C. : Democracy Now. Archived from the original on January 20, 2013. ^ Swartz, Aaron (August 16, 2012). "How we stopped SOPA" (video). Speech at ThoughtWorks New York. Yahoo!. ^ Klein, Sam (July 24, 2011). "Aaron Swartz vs. United States". The Longest Now. Weblogs at Harvard Law School. He founded watchdog.net to aggregate ... data about politicians – including where their money comes from. ^ "The team". Watchdog.net. Archived from the original on December 23, 2008. Founder Aaron Swartz ... We're funded by a grant from the Sunlight Network and the Sunlight Foundation. ^ Norton, Quinn (March 3, 2013). "Life inside the Aaron Swartz investigation". The Atlantic. D.C. Retrieved March 8, 2013. ^ a b c McVeigh, Karen, Aaron Swartz's partner accuses US of delaying investigation into prosecution, The Guardian, March 1, 2013. Retrieved May 20, 2015. ^ a b Swartz, Aaron (July 2008). "Guerilla Open Access Manifesto". Internet Archive. We need to buy secret databases and put them on the Web. We need to download scientific journals and upload them to file sharing networks. ^ Murphy, Samantha (July 22, 2011). "'Guerilla activist' releases 18,000 scientific papers". MIT Technology Review. In a 2008 'Guerilla Open Access Manifesto,' Swartz called for activists to 'fight back' against services that held academic papers hostage behind paywalls. ^ Leopold, Jason (January 18, 2013). "Aaron Swartz's FOIA Requests Shed Light on His Struggle". The Public Record. Retrieved January 23, 2013. ^ "FOI Request: Records related to Bradley Manning". Muckrock. Retrieved January 23, 2013. ^ "Remembering Aaron Swartz The Wikipedian". thewikipedian.net. January 15, 2013. ^ a b c Swartz, Aaron (September 4, 2006). "Who Writes Wikipedia?". Raw Thought. Archived from the original on August 3, 2014. Retrieved January 12, 2013. ^ Blodget, Henry (January 3, 2009). "Who The Hell Writes Wikipedia, Anyway?". Business Insider. Retrieved January 12, 2013. ^ a b c Larissa MacFarquhar (March 11, 2013). "Requiem for a dream: The tragedy of Aaron Swartz". The New Yorker. [Swartz] wrote a script that instructed his computer to download articles continuously, something that was forbidden by JSTOR's terms of service.... He spoofed the computer's address.... This happened several times. MIT traced the requests to his laptop, which he had hidden in an unlocked closet. ^ Lindsay, Jay (July 19, 2011). "Feds: Harvard fellow hacked millions of papers". Boston. Associated Press. Retrieved January 15, 2013. ^ "JSTOR Statement: Misuse Incident and Criminal Case". JSTOR. Retrieved January 12, 2013. ^ Peters, Justin (February 7, 2013). "The Idealist: Aaron Swartz wanted to save the world. Why couldn't he save himself?". Slate. N.Y.C. 6. Archived from the original on February 10, 2013. Retrieved February 10, 2013. The superseding indictment ... claimed that Swartz had 'contrived to break into a restricted-access wiring closet at MIT.' But the closet door had been unlocked—and remained unlocked even after the university and authorities were aware that someone had been in there trying to access the school's network. ^ a b Merritt, Jeralyn (January 14, 2013). "MIT to conduct internal probe on its role in Aaron Swartz case". TalkLeft (blog). Att'y Jeralyn Merritt. The wiring closet was not locked and was accessible to the public. If you look at the pictures supplied by the Government, you can see graffiti on one wall. ^ "JSTOR Statement: Misuse Incident and Criminal Case". JSTOR. July 19, 2011. ^ "Aaron Swartz, Internet Pioneer, Found Dead Amid Prosecutor 'Bullying' In Unconventional Case". HuffPost. January 12, 2013. ^ JSTOR (July 30, 2013). "JSTOR Evidence in United States vs. Aaron Swartz. Page 136". Archived from the original (PDF-1.6) on March 1, 2017 – via Archive.org. ^ JSTOR (July 30, 2013). "JSTOR Evidence in United States vs. Aaron Swartz. Page 134". Archived from the original (PDF-1.6) on March 1, 2017 – via Archive.org. ^ JSTOR (July 30, 2013). "JSTOR Evidence in United States vs. Aaron Swartz". Archived from the original (PDF-1.6) on March 1, 2017 – via Archive.org. ^ JSTOR (July 30, 2013). "JSTOR Evidence in United States vs. Aaron Swartz. Page 3142". Archived from the original (PDF-1.6) on March 1, 2017 – via Archive.org. ^ JSTOR (July 30, 2013). "JSTOR Evidence in United States vs. Aaron Swartz. Page 3143". Archived from the original (PDF-1.6) on March 1, 2017 – via Archive.org. ^ JSTOR (July 30, 2013). "JSTOR Evidence in United States vs. Aaron Swartz. Page 3127". Archived from the original (PDF-1.6) on March 1, 2017 – via Archive.org. ^ JSTOR (July 30, 2013). "JSTOR Evidence in United States vs. Aaron Swartz. Page 3128". Archived from the original (PDF-1.6) on March 1, 2017 – via Archive.org. ^ JSTOR (July 30, 2013). "JSTOR Evidence in United States vs. Aaron Swartz. Page 3129". Archived from the original (PDF-1.6) on March 1, 2017 – via Archive.org. ^ JSTOR (July 30, 2013). "JSTOR Evidence in United States vs. Aaron Swartz. Page 3136". Archived from the original (PDF-1.6) on March 1, 2017 – via Archive.org. ^ Singel, Ryan (February 27, 2011). "Rogue academic downloader busted by MIT webcam stakeout, arrest report says". Wired. N.Y.C. Swartz is accused ... of stealing the articles by attaching a laptop directly to a network switch in ... a 'restricted' room, though neither the police report nor the indictment [mentions] a door lock or signage indicating the room is off-limits. ^ Hawkinson, John (November 18, 2011). "Swartz indicted for breaking and entering". The Tech. MIT. p. 11. Swartz ... was indicted ... in Middlesex Superior Court ... for breaking and entering, larceny over $250, and unauthorized access to a computer network. ^ "Cambridge man indicted on breaking & entering charges, larceny charges in connection with data theft" (Press release). Middlesex District Attorney. November 17, 2011. Archived from the original on June 16, 2018. Retrieved May 30, 2015. Swartz ... was indicted today on charges of Breaking and Entering with Intent to Commit a Felony, Larceny over $250, and Unauthorized Access to a Computer Network by a Middlesex Superior Grand Jury. ^ a b Hawkinson, John State drops charges against Swartz; federal charges remain The Tech, March 16, 2012. Retrieved May 14, 2013. ^ Bombardieri, Marcella (March 30, 2014). "The inside story of MIT and Aaron Swartz". Boston Globe. Retrieved November 19, 2015. ^ "US Government Ups Felony Count in JSTOR/Aaron Swartz Case From Four To Thirteen". Tech dirt. September 17, 2012. Retrieved January 12, 2013. ^ a b Zetter, Kim (January 29, 2013). "Congress Demands Justice Department Explain Aaron Swartz Prosecution | Threat Level". Wired. Retrieved February 1, 2013. ^ Smith-Spark, Laura. "Prosecutor defends case against Aaron Swartz". CNN. Retrieved June 13, 2014. ^ Cullen, Kevin; Ellement, John. "MIT hacking case lawyer says Aaron Swartz was offered plea deal of six months behind bars". Boston Globe. Boston Globe Media Partners, LLC. Retrieved June 13, 2014. ^ Dean, John. "Dealing With Aaron Swartz in the Nixonian Tradition: Overzealous Overcharging Leads to a Tragic Result". Verdict from Justia. Retrieved May 28, 2016. ^ Boeri, David (February 20, 2013). "Ortiz Under Fire: Critics Say Swartz Tragedy Is Evidence Of Troublesome Pattern". WBUR. Retrieved May 16, 2014. ^ Landergan, Katherine (January 14, 2013). "US District Court drops charges against Aaron Swartz – MIT – Your Campus". Boston Globe. Retrieved January 23, 2013. ^ United States v. Swartz , 1:11-cr-10260, 106 (D. Mass. filed January 14, 2013). ^ Poulsen, Kevin (December 4, 2013). "This Is the MIT Surveillance Video That Undid Aaron Swartz". Wired. Retrieved December 7, 2013. ^ "Taren Stinebrickner-Kauffman is Aaron Swartz's Girlfriend who found him". ShowBizDaily.net. February 5, 2013. ^ a b Kemp, Joe; Trapasso, Clare; Mcshane, Larry (January 12, 2013). "Aaron Swartz, co-founder of Reddit and online activist, hangs himself in Brooklyn apartment, authorities say". Daily News. New York. Swartz ... left no note before his Friday morning death in the seventh-floor apartment at a luxury Sullivan Place building, police sources said. ^ a b "Co-founder of Reddit Aaron Swartz found dead". News. CBS. January 13, 2013. Retrieved January 12, 2013. ^ Lessig, Lawrence (January 12, 2013). "Prosecutor as bully". Retrieved January 12, 2013. ^ Gustin, Sam (January 14, 2013). "MIT orders review of Aaron Swartz suicide as soul searching begins". Time. Retrieved January 16, 2013. ^ Lessig, Lawrence (January 12, 2013). "Prosecutor as bully". Lessig Blog, v2. Aaron consulted me as a friend and lawyer.... [M]y obligations to Harvard created a conflict that made it impossible for me to continue as a lawyer.... I get wrong. But I also get proportionality. ^ Thomas, Owen (January 12, 2013). "Family of Aaron Swartz Blames MIT, Prosecutors For His Death". Business Insider. Retrieved January 12, 2013. ^ Gallardo, Michelle (January 15, 2013). "Aaron Swartz, Reddit co-founder, remembered at funeral". ABC News. Retrieved January 15, 2013. ^ "Aaron Swartz Memorial Ice Cream Social Hour – Free Software Foundation – working together for free software". Fsf.org. Retrieved January 18, 2013. ^ "Aaron Swartz Tribute: Hundreds Honor Information Activist". HuffPost. January 19, 2013. Archived from the original on November 9, 2014. Retrieved January 20, 2013. ^ Hsieh, Steven, Why Did the Justice System Target Aaron Swartz?, Rolling Stone, January 23, 2013. Retrieved January 26, 2013. ^ Peltz, Jennifer (January 19, 2013). "Aaron Swartz Tribute: Hundreds Honor Information Activist". Associated Press. Retrieved February 8, 2013. ^ Fishman, Rob (January 19, 2013). "Grief And Anger at Aaron Swartz's Memorial". BuzzFeed. Retrieved January 26, 2013. ^ "Memorial for Aaron Swartz | Internet Archive Blogs". Retrieved January 18, 2013. ^ "Aaron Swartz DC Memorial". Aaronswartzdcmemorial.eventbrite.com. Retrieved February 1, 2013. ^ Henry. "Aaron Swartz Memorial in Washington DC". Crookedtimber.org. Retrieved February 1, 2013. ^ a b c Gross, Grant, Lawmakers pledge to change hacking law during Swartz memorial, InfoWorld, February 5, 2013. Retrieved February 5, 2013. ^ a b c Carter, Zach (February 5, 2013). "Aaron Swartz Memorial on Capitol Hill Draws Darrell Issa, Elizabeth Warren". HuffPost. Retrieved February 5, 2013. ^ Taren Stinebrickner-Kauffman (March 13, 2013). "TarenSK: MIT Memorial Service". Retrieved March 15, 2013. including links to video of the ceremony/speeches. ^ Rob Fishman (January 19, 2013). "Grief And Anger at Aaron Swartz's Memorial". Retrieved July 16, 2014. ^ Holden Karnofsky (January 16, 2013). "In memory of Aaron Swartz". Retrieved July 16, 2014. ^ a b "Remember Aaron Swartz". Tumblr. Archived from the original on January 13, 2013. Retrieved January 12, 2013. ^ Guy, Sandra (January 15, 2013). "Aaron Swartz was 'killed by government,' father says at funeral". Chicago Sun-Times. Archived from the original on August 24, 2014. Swartz's father ... said that at a school event, 3-year-old Aaron read to his parents while all of the other parents read to their children. ^ Murphey, Shelly, US attorney's husband stirs Twitter storm on Swartz case, Boston Globe, January 16, 2013.. Retrieved January 17, 2013. ^ Pierce, Charles P. (January 17, 2013). "Still More About The Death Of Aaron Swartz", Esquire. Retrieved January 18, 2013. ^ McCullagh, Declan, "Prosecutor in Aaron Swartz 'hacking' case comes under fire", CNET, January 15, 2013. Retrieved January 17, 2013. ^ Stout, Matt. "Ortiz: We never intended full penalty for Swartz", Boston Herald, January 17, 2013. Retrieved January 17, 2013. ^ Barnes, James. "Hacker's suicide linked to 'overzealous' prosecutors", The Global Legal Post, January 15, 2013. Retrieved January 17, 2013. ^ Dobuzinskis, Alex; P.J. Huffstutter (January 13, 2013). "Internet activist, programmer Aaron Swartz dead at 26". Reuters. That belief – that information should be shared and available for the good of society – prompted Swartz to found the nonprofit group Demand Progress. ^ Vartanian, Hrag (February 7, 2013). "A roller tribute to two digital anarchist heroes". Brooklyn, NY: Hyperallergic. Retrieved June 1, 2013. ^ Yuval Noah Harari (April 18, 2013). "Data Processing – Part 1" (Video). Retrieved September 27, 2018. ^ Zak, Dan (July 26, 2013). "'Printing Out the Internet' exhibit is crowdsourced work of art". The Washington Post. Archived from the original on October 17, 2013. Retrieved August 20, 2013. ^ "Crowdsourced art project aims to print out entire internet". CBC News. July 30, 2013. ^ Mahler, Jonathan (July 24, 2014). "Heady Summer, Fateful Fall for Dinesh D'Souza, a Conservative Firebrand". The New York Times. Retrieved December 12, 2016. ^ McGovern, Joe (August 11, 2014). "America: Imagine the World Without Her". Entertainment Weekly. Retrieved December 12, 2016. ^ Keilman, John (January 18, 2016). "Legacy of open access activist still growing". Chicago Tribune. Section 1, Page 3. ^ "Aaron Swartz documentary". TakePart. Retrieved November 19, 2014. ^ Zelman, Joanna. "WATCH: Aaron Swartz Found NSA Scope 'Scary'". HuffPost. ^ "The Internet's Own Boy: The Story Of Aaron Swartz – Festival Program". Sundance Institute. Archived from the original on March 25, 2014. ^ "The Internet's Own Boy: Film on Aaron Swartz Captures Late Activist's Struggle for Online Freedom". Democracy Now!. January 21, 2014. Retrieved January 21, 2014. ^ Knappenberger, Brian. "The Internet's Own Boy: The Story of Aaron Swartz". Internet Archive. Retrieved August 3, 2014. ^ "'The Internet's Own Boy' fights for reform after Aaron Swartz's death". ^ Matheson, Whitney (June 28, 2014). "Internet's Own Boy: Tech activist's legacy". USA Today. p. B8. ^ "'The Internet's Own Boy' Is a Powerful Homage to Aaron Swartz". Mashable. January 23, 2014. Retrieved January 23, 2014. ^ DeFore, John (January 21, 2014). "The Internet's Own Boy: The Story of Aaron Swartz: Sundance Review". The Hollywood Reporter. Retrieved January 23, 2014. ^ a b von Busack, Richard. "Breaking the Internet: Killswitch Screens at Cinequest". Metro Silicon Valley. Retrieved February 25, 2015. ^ a b Swegles, Fred. "Battle for Internet Control Fuels O.C. -produced Movie". Orange County Register. Retrieved April 16, 2015. ^ a b Grayson, Alan. "Grayson Screen Award Winning "Killswitch" Documentary". Congressman Grayson's House of Rep Official Web Page. Archived from the original on February 27, 2015. Retrieved February 23, 2015. ^ "The Price That You Pay for Rocking The Boat". HuffPost. March 27, 2015. Retrieved March 27, 2015. ^ Gill, Kathy. "Lawrence Lessig at 'Killswitch' Seattle Premiere: Money, Politics, and the Battle for the Internet". GeekWire. Retrieved June 5, 2015. ^ "Patriot of the Web". IMDb. October 13, 2018. ^ "Patriot of the Web". reelhouse.org. ^ "Patriot of the Web – Darius Burke – Watch Online for Just $4.99 – grandadproductions". grandadproductions. ^ Andreeva, Nellie (December 4, 2017). "'Think Aaron' Movie Based on Life Of "Hacktivist' Aaron Swartz in Works at HBO Films". Deadline Hollywood. ^ "PDF Tribute". Archived from the original on January 15, 2013. Retrieved January 15, 2013. ^ Cutler, Kim-Mai (January 13, 2013). "PDF tribute to Aaron Swartz attracts roughly 1,500 links to copyright-protected research". TechCrunch. ^ a b Musil, Steven (January 13, 2013). "Researchers honor Swartz's memory with PDF protest". CNet News. ^ Vivalt, Eva (January 12, 2013). "In memoriam". Aid Economics. Eva Vivalt. Archived from the original on March 13, 2013. ^ "Who we are". aidgrade.org. 2012. Retrieved April 7, 2013. ^ Ohlheiser, Abby (January 14, 2013). "Aaron Swartz death: #pdftribute hashtag aggregates copyrighted articles released online in tribute to internet activist". Slate. Retrieved January 16, 2013. ^ "Economie de la publication scientifique et libre accès: un débat relancé par la mort d'Aaron Swartz". Slate (in French). January 21, 2013. Retrieved October 8, 2018. ^ Aaron, Swartz; Lessig, Lawrence; Bortolotti, Marie-Mathilde; Szidon, Amarante (March 22, 2017). Celui qui pourrait changer le monde : Aaron Swartz, écrits 1986–2013. Éditions B42 – DL 2017. ISBN 9782917855775. OCLC 993094009. ^ "La controverse en matière de publication des articles scientifiques". Retrieved October 8, 2018. ^ Manjoo, Farhad How MIT Can Honor Aaron Swartz Slate, January 31, 2013. Retrieved May 9, 2013. ^ Chan, Jennifer, To honor Aaron Swartz, let knowledge go free, U.S. News & World Report, 1 February 2013.. Retrieved February 2, 2013. ^ Project, Free Law. "RECAP Project – Turning PACER Around". recapthelaw.org. ^ Kopfstein, Janus (March 13, 2013). "Aaron Swartz to receive posthumous 'Freedom of Information' award for open access advocacy". The Verge. Retrieved March 24, 2013. ^ "James Madison Award". Ala.org. January 17, 2013. Retrieved March 24, 2013. ^ "Entire library journal editorial board resigns, citing 'crisis of conscience' after death of Aaron Swartz". The Verge. ^ New, Jake (March 26, 2013). "Journal's Editorial Board Resigns in Protest of Publisher's Policy Toward Authors". The Chronicle of Higher Education. Retrieved May 30, 2015. ^ "It was just days after Aaron Swartz' death, and I was having a crisis of conscience about publishing in a journal that was not open access". Feral Librarian. Retrieved November 19, 2014. ^ Swartz, Aaron. "If I get hit by a truck..." Archived from the original on January 17, 2003. Retrieved May 29, 2016. ^ "Aaron Swartz". The Economist. January 19, 2013. Retrieved January 20, 2013. ^ "Science Europe – 'Plan S' Making Open Access a Reality by 2020". scienceeurope.org. Retrieved October 14, 2018. ^ "Anonymous hacks MIT Web sites to post Aaron Swartz tribute, call to arms". The Washington Post. Retrieved January 13, 2013. ^ Swartz, Aaron (August 2, 2009). "Life in a world of pervasive immorality: The ethics of being alive". Raw Thought: Aaron Swartz's Weblog. Is there sense in following [the] rules or are they just another example of the world's pervasive immorality? ^ Kao, Joanna (January 23, 2013). "MIT DNS hacked; traffic redirected". The Tech. MIT. p. 1. From 11:58 a.m. to 1:05 pm, MIT's DNS was redirected ... to CloudFlare, where the hackers had configured servers to return a Harvard IP address.... By 7:15 pm, CloudFlare removed the 'mail.mit.edu' record, which referred to the machine ... at KAIST. ^ Reported by Sabari Selvan. "United States Sentencing Commission(ussc.gov) hacked and defaced by Anonymous | Security updates". Ehackingnews.com. Retrieved January 29, 2013. ^ "Hackers take over sentencing commission website". Associated Press. January 26, 2013. 'Two weeks ago today, a line was crossed,' the statement said. ^ Aarons ArkAngel (January 26, 2013). "Anonymous Operation Last Resort: Anonymous hacked USSC.GOV" (Flash video) – via YouTube. ^ "Anonymous hackers target US agency site". BBC News. January 26, 2013. The hackers ... said the site was chosen for symbolic reasons. 'The federal sentencing guidelines ... enable prosecutors to cheat citizens of their constitutionally guaranteed right to a fair trial ...,' the video statement said. ^ "Swartz' death fuels debate over computer crime". USA Today. January 14, 2013. Retrieved January 29, 2013. ^ Smith, Gerry (January 15, 2013). "Aaron Swartz case 'snowballed out of MIT's hands,' source says". HuffPost. Retrieved January 16, 2013. ^ "homepage". Swartz Review. MIT. January 23, 2013. Archived from the original on February 6, 2013. IS&T has created this web site so [community members] can suggest questions and issues to guide the review... What questions should MIT be asking at this stage of the Aaron Swartz review? ^ Nanos, Janelle (January 24, 2013). "MIT prof announces plans for Swartz review: A website is launched allowing for discussion of how his case was handled". Boston Magazine. ^ "MIT and Aaron Swartz's lawyers argue over releasing evidence". Techdirt. March 20, 2013. Retrieved March 24, 2013. ^ Rebecca Greenfield (March 19, 2013). "MIT's peace offering of Aaron Swartz documents still won't be enough". The Atlantic Wire. Retrieved March 24, 2013. ^ "Report Details MIT's Involvement in the Aaron Swartz Case". alum.mit.edu. August 2013. Archived from the original on August 29, 2013. Retrieved September 7, 2016. ^ "MIT releases report on its actions in the Aaron Swartz case". MIT news. MIT News Office. July 30, 2013. Retrieved July 30, 2013. ^ "Report to the President: MIT and the Prosecution of Aaron Swartz" (PDF). Massachusetts Institute of Technology. 2013. Retrieved July 30, 2013. ^ "Petition: "Remove United States District Attorney Carmen Ortiz from office for overreach in the case of Aaron Swartz."". Wh.gov. January 12, 2013. Archived from the original on February 18, 2013. Retrieved January 20, 2013. ^ Smith, Gerry (January 13, 2013). "Were The Charges Against Internet Activist Aaron Swartz Too Severe?". HuffPost. ^ "Fire Assistant U.S. Attorney Steve Heymann". White House. January 12, 2013. Archived from the original on October 19, 2013. Retrieved January 29, 2013. ^ Glenn Greenwald (January 16, 2013). "Carmen Ortiz and Stephen Heymann: accountability for prosecutorial abuse | guardian.co.uk". The Guardian. London. Retrieved January 29, 2013. ^ "Convicted hacker Stephen Watt on Aaron Swartz: 'It's just not justice'". VentureBeat. January 25, 2013. Retrieved January 29, 2013. ^ Fung, Brian; Peterson, Andrea (January 8, 2015). "After long delay, Obama declines to rule on petition calling for firing of DOJ officials over Aaron Swartz's suicide". The Washington Post. Retrieved March 13, 2015. ^ a b Sasso, Brendan; Jennifer Martinez (January 15, 2013). "Lawmakers slam DOJ prosecution of Swartz as 'ridiculous, absurd'". Hillicon Valley. The Hill. ^ a b Reilly, Ryan J. (January 15, 2013). "Darrell Issa Probing Prosecution of Aaron Swartz, Internet Pioneer Who Killed Himself". HuffPost. Retrieved January 20, 2013. ^ "United States Senator John Cornyn, Texas". United States Senator John Cornyn, Texas. ^ Pearce, Matt (January 18, 2013). "Aaron Swartz suicide has U.S. lawmakers scrutinizing prosecutors". Los Angeles Times. Retrieved January 20, 2013. ^ Carter, Zach (January 18, 2013). "John Cornyn Criticizes Eric Holder Over Aaron Swartz's Death". HuffPost. Retrieved January 20, 2013. ^ "Top senator scolds Holder over Reddit founder's suicide". The Washington Times. January 18, 2013. Retrieved January 20, 2013. ^ "Issa letter to Holder on Aaron Swartz case" (PDF). Retrieved February 1, 2013. ^ Boeri, David and David Frank, Ortiz Under Fire: Critics Say Swartz Tragedy Is Evidence Of Troublesome Pattern, WBUR, February 20, 2013. Retrieved February 24, 2013. ^ a b c Reilly, Ryan J., Aaron Swartz Prosecutors Weighed 'Guerilla' Manifesto, Justice Official Tells Congressional Committee, HuffPost, February 22, 2013. Retrieved March 2, 2013. ^ a b c Masnick, Mike, DOJ Admits It Had To Put Aaron Swartz In Jail To Save Face Over The Arrest, techdirt, February 25, 2013. Retrieved March 2, 2013. ^ Masnick, Mike (March 7, 2013). "Holder: DOJ used discretion in bullying Swartz, press lacked discretion in quoting facts". Techdirt. ^ Masnick, Mike (March 8, 2013). "Aaron Swartz's partner accuses DOJ of lying, seizing evidence without a warrant & withholding exculpatory evidence". Techdirt. ^ Carter, Zach (March 22, 2013). "Al Franken Sends Eric Holder Letter Over 'Remarkably Aggressive' Aaron Swartz Prosecution". HuffPost. Retrieved March 24, 2013. ^ H.R. 2454 at Congress.gov; H.R. 2454 at GovTrack; H.R. 2454 Archived November 12, 2013, at the Wayback Machine at OpenCongress. S. 1196 at Congress.gov; S. 1196 at GovTrack; S. 1196 Archived November 12, 2013, at the Wayback Machine at OpenCongress. ^ Musil, Steven (November 30, 2011). "New 'Aaron's Law' aims to alter controversial computer fraud law". Internet & Media News. CNET. Retrieved January 16, 2013. ^ Greenberg, Andrew 'Andy' (January 16, 2013). "'Aaron's Law' Suggests Reforms To Computer Fraud Act (But Not Enough To Have Protected Aaron Swartz)". Forbes. Retrieved January 16, 2013. ^ Kerr, Oren, Aaron's Law, Drafting the Best Limits of the CFAA, And A Reader Poll on A Few Examples Volokh Conspiracy, January 27, 2013. Retrieved April 23, 2013. ^ "Help Protect The Next Aaron Swartz". Aclu.org. January 11, 2013. Retrieved February 7, 2013. ^ "Reform Draconian Computer Crime Law". Action.eff.org. Retrieved February 7, 2013. ^ a b "Video of Lawrence Lessig's lecture, Aaron's Laws: Law and Justice in a Digital Age". February 20, 2013. Retrieved March 24, 2013 – via YouTube. ^ Lawrence Lessig. "the next words: A Lecture on Aaron's Law". Lessig. Retrieved February 21, 2013. ^ "Transcript: Lawrence Lessig on 'Aaron's Laws: Law and Justice in a Digital Age'". Archived from the original on November 22, 2017. Retrieved April 20, 2013. ^ "Harvard Civil Rights-Civil Liberties Law Review – A summary of Lawrence Lessig's Chair Lecture at Harvard Law School". Harvardcrcl.org. January 14, 2013. Retrieved May 30, 2015. ^ Dekel, Jonathan (May 1, 2014). "Swartz doc director: Oracle and Larry Ellison killed Aaron's Law". Postmedia. ^ Peterson, Andrea (February 16, 2013). "How FASTR Will Help Americans". Thinkprogress.org. Retrieved March 24, 2013. ^ "Wyden Bill Makes Taxpayer Funded Research Available to the Public | U.S. Senator Ron Wyden". Wyden.senate.gov. February 14, 2013. Retrieved March 24, 2013. ^ "White House Issues Public Access Directive". Publishers Weekly. February 22, 2013. Retrieved May 28, 2013. ^ Rosenblatt, Seth (November 9, 2013). "Call to action kicks off second Aaron Swartz hackathon". CNET News. Retrieved November 10, 2013. ^ Guthrie Weissman, Cale (November 8, 2013). "Tonight begins the second annual Aaron Swartz hackathon". Pando Daily. Retrieved November 10, 2013. ^ "Aaron Swartz Hackathon". Archived from the original on March 29, 2014. Retrieved November 9, 2013. ^ Higgins, Parker (November 6, 2001). "Aaron Swartz Hackathons This Weekend to Continue his Work". Electronic Frontier Foundation (EFF). Retrieved November 10, 2013. ^ Rocheleau, Matt (October 21, 2013). "In Aaron Swartz' memory, hackathons to be held across globe, including at MIT, next month". Boston. Retrieved November 10, 2013. ^ "Worldwide Aaron Swartz Memorial Hackathon Series". Noisebridge. Retrieved November 9, 2013. ^ "Aaron projects". Noisebridge. Retrieved November 9, 2013. ^ Lessig, Lawrence (January 10, 2014). "Aaron's Walk: The New Hampshire Rebellion". HuffPost. Retrieved September 5, 2014. ^ Boyko, Brian (January 11, 2014). "It Begins. Thank you". Retrieved September 5, 2014. ^ "Information Power to The People". Ahmet Öğüt's website. Retrieved March 31, 2019. ^ a b Murphy, Kate (March 12, 2016). "Should All Research Papers Be Free?". The New York Times. ISSN 0362-4331. Retrieved August 23, 2016. ^ McNutt, Marcia. "Science Magazine". Science. ^ "A spiritual successor to Aaron Swartz is angering publishers all over again". Retrieved August 23, 2016. ^ Poulsen, Kevin. "Strongbox and Aaron Swartz". The New Yorker. Retrieved May 16, 2013. ^ Davidson, Amy (May 15, 2013). "Introducing Strongbox". The New Yorker. Retrieved June 20, 2013. ^ Kassner, Michael (May 20, 2013). "Aaron Swartz legacy lives on with New Yorker's Strongbox: How it works". TechRepublic. Retrieved June 20, 2013. ^ Charlton, Alistair (October 16, 2013). "Aaron Swartz-Designed Whistleblower Tool SecureDrop Launched by Press Freedom Foundation". International Business Times. Archived from the original on October 17, 2013. ^ Gruber, John. "Daring Fireball: Markdown". Daring Fireball. Archived from the original on April 2, 2004. Retrieved April 25, 2014. ^ "atx, the true structured text format". ^ "Daring Fireball – Markdown – Syntax". ^ "MARC Records from Scriblio 2007". Internet Archive. ^ "RDFCore Working Group Membership". W3. December 1, 2002. Retrieved January 15, 2013. ^ Aaron, Swartz. "In Defense of Anonymity". Retrieved February 4, 2014. ^ Zetter, Kim (December 12, 2008). "New Service Makes Tor Anonymized Content Available to All". Wired. Retrieved February 22, 2014. ^ "tor2web brings anonymous Tor sites to the "regular" web". arstechnica.com. Retrieved February 22, 2014. ^ "Not A Bug, Inc.: Private company information". Bloomberg Business. October 31, 2006. Retrieved May 30, 2015. The company owns and operates portals that allow users to post contents and create Websites.... As of October 31, 2006, [it] is a subsidiary of CondéNet, Inc.... Key Executives for Not A Bug, Inc.: ... Huffman, President and Director; ... Swartz, Treasurer and Director; ... Ohanian, Secretary and Director. ^ "There was a third 'co-founder' of reddit", Today I Learned, Reddit, October 18, 2010, Aaron isn't a founder of reddit.